José Francisco Ruiz was a Mexican soldier who fought for Mexico’s independence from Spain and later supported Texas’s struggle for independence from Mexico. He is most noted for being one of only two native-born Texans to sign the 1836 Texas Declaration of Independence, even though he was “horrified” by the idea. Ruiz spent considerable time among the Texas Indians, most notably the Comanches. He was well thought of by the Indians and was influential in brokering peace agreements with several Texas tribes. Ruiz thus appears as the Mexican Indian administrator in Napoleon in America. 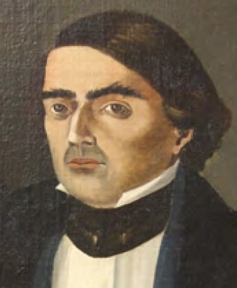 José Francisco Ruiz was born around January 28, 1783, in San Antonio de Béxar (now San Antonio, Texas), which was then part of Spanish-ruled Mexico. He was the son of Juan Manuel Ruiz and María Manuela de la Peña. At some point Ruiz left San Antonio to receive an education at a college in Spain. When he returned in 1803, he was appointed the first schoolmaster of San Antonio. On March 8, 1804, he married Maria Joséfa Hernandez, with whom he had three children. Ruiz tended his father’s ranch and served in various official capacities in San Antonio, including regidor (town councilman) in 1805 and procurador (town attorney) in 1809. In 1811, José Francisco Ruiz joined the Béxar Provincial Militia with the rank of lieutenant. The Mexican revolution had begun the year before. In 1813, Ruiz became one of the insurgents seeking independence from Spain. He fought in the Battle of Medina on August 18, 1813, in which Spanish troops defeated rebel forces. [E]ver since the Year of 1813, and particularly since the unfortunate Battle of the Medina, my [Un]cle Francisco Ruiz, my Brother-in-Law [Juan Martín de] Veramendi, my aforesaid Brother Angel, and even ourselves the minors of the family have fallen into a horrid persecution on the part of all the Spanish officers devoted to the cause of their King. The names of Ruiz, Veramendi and Navarro was the mark of ignominy, the alarm of treason, and of all evil that could be invoked against the holy cause and the rights of the King of Spain…. Comanche Indians by George Catlin. José Francisco Ruiz was instrumental in helping the Mexican government make peace with the Comanches and other tribes in the 1820s. 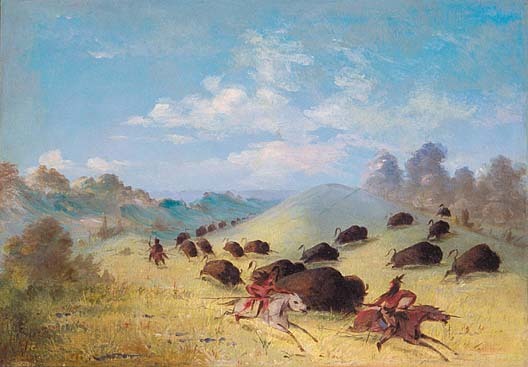 Ruiz convinced the Comanche leaders to proceed to San Antonio, where they agreed to a truce in August 1822. Ruiz then accompanied a Comanche delegation to Mexico City to sign a formal treaty. In 1824, when the Mexican government made money available for presents to be distributed under the terms of the treaty, Ruiz was appointed the distributor. He was, in effect, the Indian agent at San Antonio. Meanwhile, Ruiz continued to manage his large ranch holdings in the area. He also received a promotion to the rank of lieutenant colonel in the Mexican army. In December 1826, he was sent to Nacogdoches to help put down the Fredonian Rebellion. As the commander in Nacogdoches, Ruiz was instrumental in making peace with the Waco and Tawakoni tribes in mid-1827. In 1830, Ruiz was dispatched with the Álamo de Parras company to establish a military post on the Brazos River, called Fort Tenoxtitlán. The aim was to provide a base for the settlement of Mexican colonists and to prevent illegal American immigration and smuggling. The post suffered from isolation, hostile Indians and desertions. Ruiz was also troubled by the fact that he was not allowed to let Americans – for whom he felt sympathy – settle within his jurisdiction. In a letter to Stephen Austin dated November 26, 1830, Ruiz expressed discouragement. The following year, Ruiz wrote to Mexican Vice President Anastasio Bustamante requesting retirement or a permanent leave from the army because of failing health. In August 1832, Ruiz received orders to abandon Fort Tenoxtitlán and move his troops back to San Antonio. He officially retired from the army at the end of that year. He devoted himself to managing his substantial ranches along the San Antonio and Brazos Rivers. On March 2, 1836 Ruiz and Navarro signed the Texas Declaration of Independence. They were the only native-born Texans to do so. Ruiz’s son, Francisco Antonio Ruiz, then alcalde (mayor) of San Antonio, was an important eyewitness to the Battle of the Alamo. José Francisco Ruiz represented the San Antonio district as its senator in the first Congress of the Republic of Texas (1836-37). He died of hydropsy (edema) in San Antonio on January 19, 1840, at the age of 57. He is buried in San Fernando Cemetery Number 1. His former house is on the grounds of the Witte Museum in San Antonio. Charles Adams Gulick, Jr., and Katherine Elliott, eds., The Papers of Mirabeau Buonaparte Lamar, Vol. 3 (Austin, 1923), p. 598. Nora Elia Cantu Rios, “José Francisco Ruiz, Signer of the Texas Declaration of Independence,” M.A. Thesis, Texas Tech University, 1970, p. 27. Eugene C. Barker, ed., Annual Report of the American Historical Association for the Year 1919: Vol. II: The Austin Papers, Part 1 (Washington, 1924), pp. 541-542. Letter translated by Nora Elia Cantu Rios in “José Francisco Ruiz, Signer of the Texas Declaration of Independence,” pp. 34-35. Jacob de Cordova, Texas: Her Resources and Her Public Men (Philadelphia, 1858), p. 149. Interesting article. Keep them coming. Good read. Would like to know more about Comanches. My ancestor was taken by them and was forced to live with Chief Carne Muerte. Thanks, Julia. If you haven’t already read it, you might be interested in A Fate Worse Than Death: Indian Captivities in the West, 1830-1885 by Gregory and Susan Michno (2007). The Comanche Empire by Pekka Hämäläinen (2008) and The Comanches: A History, 1706-1875 by Thomas W. Kavanagh (1996) are also good. Unfortunately I do not, Ron. Perhaps another reader of this article has some information about Fernando Sandoval and will leave a comment. WOW!! if my ancestry leads are correct, this is my 5 times great grandfather. For years I have had no identity as to where my roots come from, but thanks to this article, I am sitting here in awe of this news. You’re welcome, Christina. I’m so glad this article helped you find out more about your ancestry. I have fought and shed my blood in my youth for Mexico and Mexican liberty; and, although advanced in years, I would offer her the aid of my arm, if I had the least glimmering of hope that this unhappy country could be capable of self-government.